The process of cleaning a hot tub can sometimes become a chore if you do not have the right tools for the job. But if you equip yourself with the best hot tub vacuum cleaner, cleaning your tub becomes less of a chore. After all, would you love to see algae all over your tub? All hot tubs even inflatable spa tubs require cleaning. This is because dirt accumulates in deep parts of the pool and can be a health hazard and besides the sight of a dirty and probably dusty pool is not a look to behold. After researching and testing different products, I have reviewed 8 hot tub vacuums that will help you maintain your tub clean. This pool cleaner is not just an ordinary vacuum that picks up the debris and particles that find their way into your pool and spa. It is a pool blaster and spa cleaner that has a powerful suction that helps to stop algae growth as well as remove small particles of sand, trash, leaf matter, organic materials, and insects from the water. You operate this handy device by pushing a simple on and off switch, and a Lithium Ion battery powers it and allows it to work at cleaning your pool or spa for a full hour, sixty uninterrupted minutes, before the battery needs to be recharged. It is cordless and hose-less so it is possibly the easiest pool cleaning system and vacuum though I am not recommending it as a good above ground pool cleaners. It comes with a reusable X-Tremem Multilayer filter that will easily pick up the larger and smaller pieces of trash and debris that you find infiltrating your clean pool water. This pool vacuum weighs only 5.5 pounds and is just 15.5 x 6.5 x 7.5 inches long so it is easy to maneuver and get in and out of the pool or spa. You can rest assured that in a few minutes time you can have the chore of cleaning the pool and spa taken care of and be ready to hop into the water and relax. This little blue device will make your life simpler because it will take the work and strain out of cleaning your pool and spa. You can swim more and clean less, and still know that your pool and spa is free of debris, trash, sand, foreign matter. It is Lithium powered and will operate for forty five minutes before the battery runs out of charge. That gives this little power house plenty of time to vacuum up all of the things you do not want to swim and splash with. It has an easy on off switch. You can easily push the button and put this powerful tool to work. It requires a minimum operating depth of 9 inches to function properly and after it has discharged the battery it will only take four hours for the battery to be recharged and ready for action. It comes complete with one reusable all-purpose filter and two micro-filters for finer cleaning. The micro-filters make sure that the fine particles that escape the normal filter are captured and removed so they are not sucked into your pool filter where they can cause clogs and overheating of your pump. This is an excellent hot tub vacuum for anyone that owns a spa, hot-tub, or above ground pool. It works quickly and is powerful enough to remove the majority of leaves, grass, trash, debris, foreign matter, small insects, sand and other particles that find their way into your pool and spa. It does the work so you don’t have to. This pool vacuum makes it easy to keep your pool clean and ready to use. It vacuums the dirt and debris out of the pool leaving you with clean water to enjoy. The removal of the excess dirt and debris also lengthens the life expectancy of your pool filtration system because fewer particles are sent into the filtration system. This vacuum can be used in any above ground pool that is 18’ id diameter or smaller. 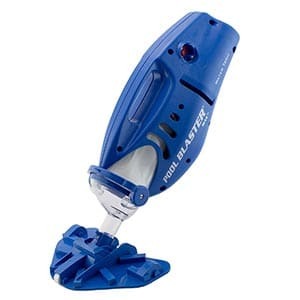 It is powered by a built in Ni-MH rechargeable battery that gives it enough strength to have a powerful suction. It comes with a USB cable for the purpose of recharging the battery. It comes with two interchangeable brush heads, a 94” lightweight telescoping shaft that is crafted from aluminum, and an adapter that will enable the shaft to fit snuggly in wider and longer telescoping aluminum shafts. This item must be submerged in water for it to work. It has a safety shut off that will disengage it when it is not submerged so your motor does not risk burning up. You can fully rely on the IPX8 waterproof switch to protect you from water submersion accidents and complications. You can enjoy your pool more than ever when you allow the Intex Handheld Rechargeable Vacuum with Telescoping aluminum shaft help you to keep all of the dirt, sand, leaf particles, and other debris out of your pool. It is easy to use and does a thorough pool cleaning job in minutes. It saves you time and effort. If you are worried about taking much of your time washing your hot tub because you probably have other errands to run, worry less because Aura 6250 paradise is here for you. 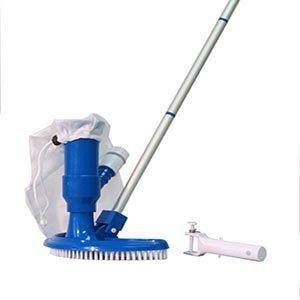 It is an amazing handheld spa vacuum that enhances the speed of the whole cleaning process of the pool. In a nick of time, all the dirt and the debris such as rocks, pennies, marbles and beach sand is cleared out of the pool. It does not rely on electricity or on batteries to work. 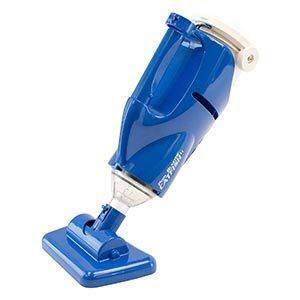 It's one of the simplest vacuum cleaners to use. This is because the principle behind it (siphon mechanism) is quite simple. Its design is also unique and contemporary in nature. It has a design that can increase the life cycle of the vacuum while at the same time maintaining the simplicity of the product. The telescope of the Aura 6250 is made of aluminum which makes it rust free and thus increases the durability of your machine. Very adaptable even for first-time users as it is easy to use and handle. Comes with aluminum which makes it be stretched into the deeper parts of the pool. It is readily available and affordable compared to other existing brands in the market. The best part is that it does not necessarily require rechargeable batteries or inflatable air pumps to work. It is great for cleaning a variety of pools like a pond, fountain, in-ground as well as above-ground and also in smasher pools, however, is well suited for above ground pools, ponds, and fountains.It is also easy to use. You simply attach the vacuum together and then you connect it to your garden hose. The vacuum works due to the force of the water pressure entering into the vacuum hence creating a venture action which now draws debris and leaves it into the mesh net or the collecting bag in place. Another advantage of the "pool supply" town mini jet vacuum cleaner is that it picks up all particles such as leaves, debris, and dirt. It is readily available hence saving you the drudgery of having to walk from one supplier to the other to get it. 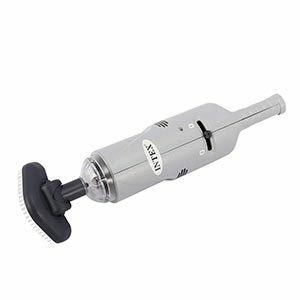 This rechargeable spa vacuum is a high performing machine that will give you the outstanding results you have been looking for. This cleaner uses batteries to function. It is a self-contained machine meaning that it is automatic in the collection of dust and debris. 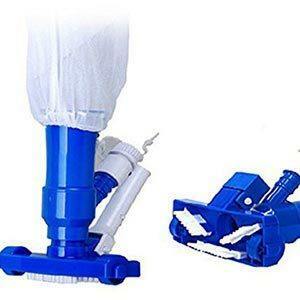 It has a very easy way to clean collection chamber whereby you can easily clean and rinse it in a short period of time before vacuuming again. It is also easy to operate as it is also cordless and lightweight. 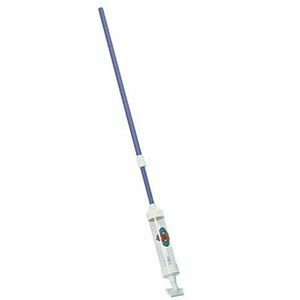 The water tech pool blaster definitely makes cleaning enjoyable.To use it, simply put in batteries at their position and adjust the pole to your desired length and then insert it into the back of the cleaner and you are definitely good to go. 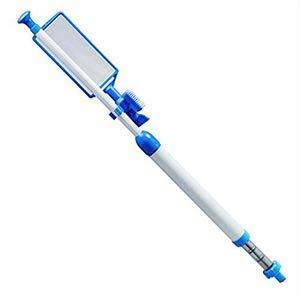 It is very effective in cleaning as it comes with a sand-silt bag that enhances the cleaning of the pool. It can also be used in a variety of pool and thus saves you a great deal of having to use different cleaners everywhere. With the advancement in technology also comes in better products that buyers and users need to consider from such as the water tech pool blaster. It was designed by water tech, who were the original investors of battery powered pool cleaners. It has been tested and found to have the longest battery powered Spa cleaners and this highly adds to its advantage, which one must consider when buying. Collects all types and sizes of dirt and debris associated with pools. It also has a rechargeable battery and it is cordless. Battery capacity wears out with time and thus it reduces the performance. Small pools can give you a hard time to clean. Well, this is where the pool and spa jet vacuum comes in as it allows you to effectively and efficiently clean the dirt and debris from your spa especially the small ones. It comes with a dual-use design giving you a choice of what method to use while using it, something that is not common in most vacuum cleaners. You may either decide to use it with a garden hose or with your pool suction hose and interestingly enough, it does not use batteries. the dirt and debris is collected into the unit's reusable filter bag which is easy to clean. It is very light and can be comfortably held with one hand in shallow areas or attached to a pole to access the deeper parts of your spa. It does not require any other additional tools for installation purposes. Its working is also less complicated, for instance, here is a few statements to keep you on the move. 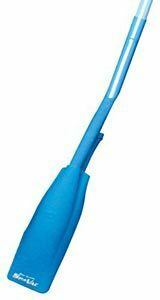 First, deep the nozzle in water and squeeze once or twice to eliminate any trapped air. Squeeze and move the" grit-gritter" forward (a distance of about 5 to 7cm) in a single movement. The next step is to now clean with your ready-to-work machine. The "grit-gritter" not only makes the cleaning process easy but also itself is easy to be cleaned. All you require to do is remove the dirt collector and pour out the dirt and rinse it. This has to be done occasionally and care should be taken not to pour the dirt stuff back into the spa. It is important to note that the "grit-gritter" is designed in such a way that it dismantles due to the effect of high pressure, should yours dismantle worry less as all you are required to do is to assemble it together as you would do after cleaning. It saves power as most of the work will be done by the hand. Helps you to burn calories as you use your hand to squeeze the" grit-gritter"
When you are buying the best hot tub vacuum, it is great if you take note of some of the things that make up the best vacuum. Consider the following things to know more hot tub cover. Money or financial status of each and every individual highly influences the decisions they make. Normally, it is not advisable to over budget as this may bring you troubles in other aspects of your life. It is, therefore, advisable for one to go for a product that will fall over his financial bracket. This means that you should not squeeze your pocket much, rather you should consider buying something that falls in your range of spending. This is a very important consideration also. Imagine buying a small-oriented cleaner for say commercial purposes which include cleaning large pools. Such a device might be cost friendly but would it suit your need? I don't think so. The size of your pool will influence whether you buy a handheld or that with a cord. Big pools for example will be best cleaned with a corded device at some storage compartment. This is because working on such large areas will get you weary before completion. Absorbing sponge is very useful when cleaning liquids and thick components such as lotion or pollen that stuck to the tub. Finally, the durability of the product has to come in play for the obvious reasons but most importantly is for saving you a few pennies especially in these hard economic times. Each product has its own period of durability and the longer the period the better. I don't think there is anyone who would want to buy a product today and then after a few days, you are back in the market again while you can buy something that gives you service for a long time. Maintenance of a product also plays a big role in the long-term durability of the product and hence an easy yet less-expensive product would be highly considered. Most of the maintenance should be simple to handle on your own for most of the above products but for sophisticated ones, it would give you trouble or cost you to hire a professional. Just like other vacuum cleaners the hot tub vacuums work with same theory expect that different companies have adjusted their products a little here and there in order to give you a variety as well as specifications when it comes to certain situations. Along with its accessories, therefore, a hot tub vacuum is a product that you can't go without having for maintenance purposes. Even the most advanced hot tub requires one. It is therefore important to know which type of cleaner suit you amidst a wide range of products. Discussed above are five of the best brands in the market that you can get to choose from without a doubt. These will confidently set you in the mood and on the way to keeping your hot tub clean and so is your environment.